Micah is a precious patient superstar and he’s only six months old. Micah joined the Aveanna Healthcare family in October of 2018 after being diagnosed with failure to thrive. Micah currently receives enteral nutrition, private duty nursing, physical therapy, and occupational therapy from the Aveanna team. Micah is diagnosed with Laryngomalacia, microgenia, Sandifer’s syndrome, severe reflux, and silent aspiration. Just a few short months ago, prior to getting his feeding tube, Micah’s ribs were protruding through his skin due to his medical conditions. He has always been in the normal range on the pediatric growth charts for height, but he was below the 1st percentile for weight. Praise report – Micah is now hitting the 96th percentile for height and 36th for weight thanks to his 24-hour continuous feedings. He is growing like a weed! Micah’s mother, Mandy, adores how much Micah loves to be held. He enjoys countless rounds of Peek-a-Boo and is starting to discover how fun it can be to play with toys. Micah has four siblings, including big brother Noah, who also receives medical services from Aveanna. Mandy and her husband have joined several supportive Facebook groups and would recommend other parents of medically fragile children do the same. 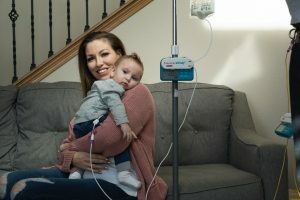 “We’ve learned feeding tube hacks and other helpful tips from families in similar situations. The support and understanding everyone shows was monumental when we were feeling alone in this battle,” shares Mandy. 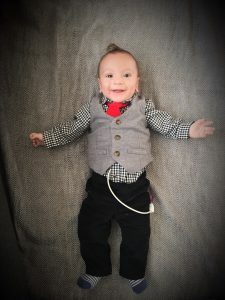 Little Micah has seen more doctors, medical equipment, and hospitals in his six months than most people have in their lifetime, but he remains as happy as can be. His immediate family and his Aveanna clinical family are all better for knowing him. Way to go, Mighty Micah!